Breakfast just wouldn't be the same without toast. 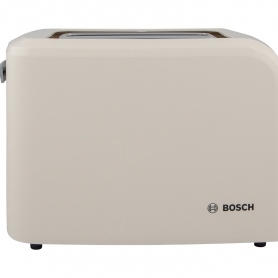 The TAT3A017GB 2 slice toaster from Bosch offers even browning and comes with a removable crumb tray. This model also comes in white and black. The TAT3A017GB keeps things simple. 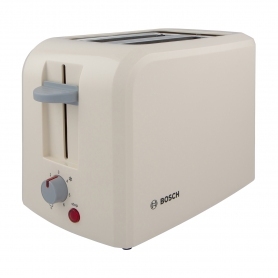 With just a few knobs and buttons you can get your toast just how you like it, every time. 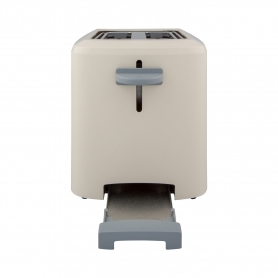 This toaster has a simple design that oozes class. As this is a 2 slice model, the dimensions are fairly compact, saving space on your kitchen countertop. The outer casing is cream, while the knob, lever handle and Bosch logo are a stylish pale grey. 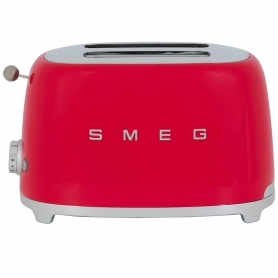 We sell a matching kettle that complements this toaster perfectly, take a look here. Alternatively, a black version is also available. Unlike some models, the TAT3A017GB won't leave the end of your slice untoasted. 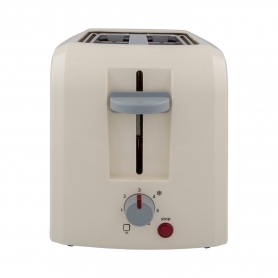 It uses large panel heating elements and an automatic bread centring system to ensure an even heating performance. There's nothing worse than when a slice of bread gets stuck in a toaster slot, and reaching in remove it with a fork or your finger is really dangerous. 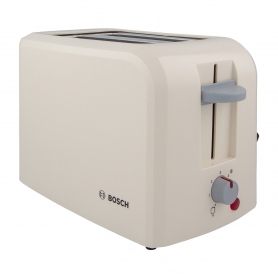 Bosch has eliminated this problem with the TAT3A017GB's high rise facility, which makes removing your toast really easy.